Over the next two weeks I’ll count down the ten 2009 songs I liked best. My ground rules are that I’ll feature only one song per album — no point in listing ten songs spread between two artists — and the albums had to be released this year. I did discover some older music this year, but those songs don’t make the cut. This year has been rather lackluster for new music, despite some strong albums at the top of my list. The albums I expected to buy mostly lived up to my expectations but what the year lacked was a group of new releases discovered through year-end best-of lists, something I’ve counted on over the past few years. I did see certain artists recurring on those lists — Animal Collective, Girls, Yeah Yeah Yeahs, Dirty Projectors — but listening to them left me cold. Thank god for YouTube, which allows me to heavily sample albums without forking over any cash. One semi-exception is Phoenix, who have been wildly overpraised but still put out a pretty good album. My wife bought this one so I haven’t bothered to review it. I’ve given the whole thing only a cursory listen and my take is that the first two songs are fabulous but the rest struggles to match the quality of those tracks. 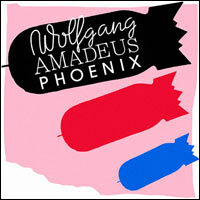 ‘1901’ was the breakout song for Phoenix (who have actually recorded three albums before this one, Wolfgang Amadeus Phoenix). Most people probably know this song from the ubiquitous Cadillac commercial that features it… if you ever watch football without skipping the ads, you’ve heard it. This entry was posted in song of the day and tagged 1901, Phoenix, Wolfgang Amadeus Phoenix. I guess it’s been a long time since I’ve watched a football game live 🙂 This song doesn’t immediately grab me, but I can imagine it might grow on me with repeated listens. On first listen, I like the sound, but not so much the voice. Saw a Phoenix show in December, and they rocked! Don’t know how I feel about this song, though, since they started using it in adverts. Oh, well. Phoenix still rocks! I think the state of the music industry being what it is, you can’t fault artists anymore for making money where they can, whether that’s in TV shows, commercials, movies, etc. That’s a good point. It’s not as though we fault music when it is written for a film, though it clearly is “selling” something in such an instance (a love story, an idea, some emotion or other). Is allowing your song to be used to sell a product so much different – especially if it’s a product you like? I wouldn’t want my song (or a song I loved) to sell some product I found morally reprehensible – but a car? Or Coca Cola? Or … (i’m having trouble thinking of what is advertised on televison – wow, how the dvr has changed our lives for the better!) Anyway, that I don’t mind so much. I never thought about the music from the Cadillac ads being anything other than a “jingle” created for them. I’ve never listened to any of the words (and so few of the lyrics actually get played that I didn’t worry about it) so to learn that this is a stand alone song is kind of strange.